What do you do when you get hand-me-downs that aren’t your size, color, or style? I’m here to recommend that you think twice before throwing it in the bag to take to Savers. Rather, why not recycle it and make something totally different? 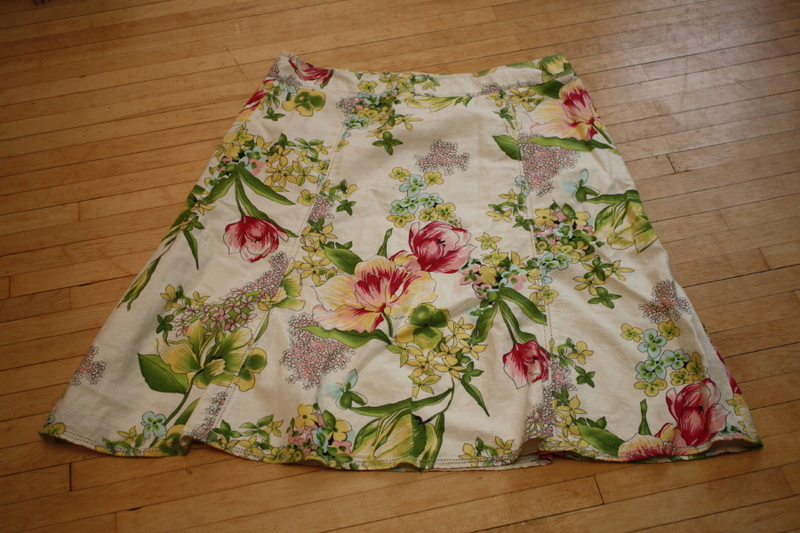 In true Proverbs 31 fashion, keeping with my goals to continue developing fruitful creative and homemaking skills, I decided to do just that with this skirt I inherited from Johanna. Cute, right? But not quite my style or size. 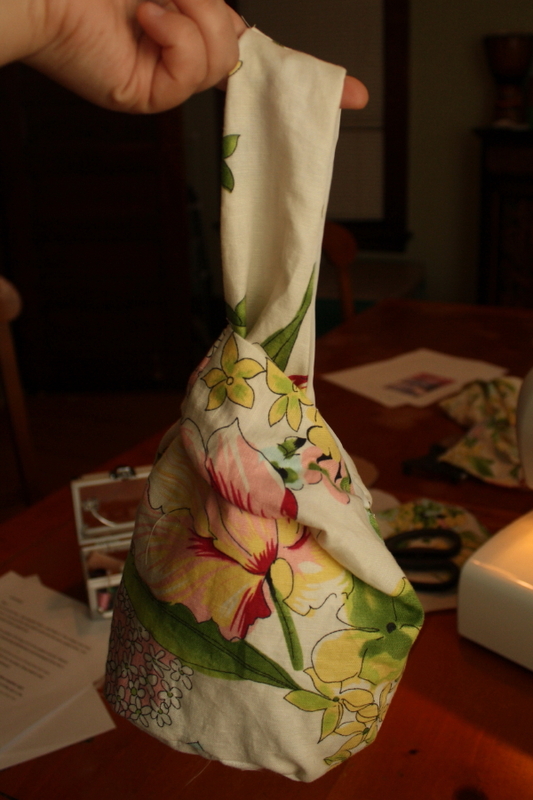 A few hours, some simple sewing, stitch-ripping, and re-sewing later – et VOILA! 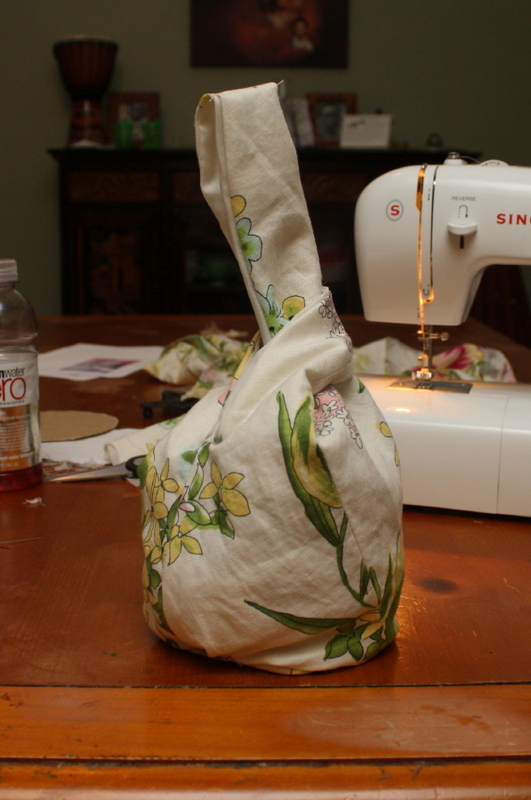 A super cute Japanese Knot Bag. This one’s just the perfect size for a few essentials for a girl’s night out – about halfway between an evening bag and a regular size purse. But I’d like to trying making bigger ones. I’m willing to be commissioned on these! I’d say this was a successful first sewing project. Special thanks to Becca for letting me borrow her machine and to Johanna for her helpful hints! Great job, Katie! I’d love to know what the pattern is. It might look cool with some of these African prints we have here.